(Note: Some of these bios were previously included in a round-up of Trump’s kitchen cabinet). Ailes was forced out at Fox News after former anchor Gretchen Carlson filed a lawsuit against him alleging sexual harassment and retaliation. Other women also came forward, alleging a decades-long pattern of harassment by Ailes. (Carlson’s suit was settled for a reported $20 million, and Fox News’ parent company issued a public apology to Carlson, saying she was not “treated with the respect and dignity that she and all of our colleagues deserve.”) . Even though Ailes was publicly disgraced, Trump has repeatedly expressed support for him.. The network Ailes created has for years functioned as the communications arm of the Republican Party, disguised as a “news” network. Fox was instrumental in the rise and eventual triumph of Trump in the 2016 Republican primaries, featuring him far more than any other candidate, which translated into millions of dollars worth of free exposure. At Fox, Ailes pushed programming with themes of misogyny, racism, and Islamophobia. Ailes was once an operative for President Richard Nixon, and he used race-baiting in his work for Nixon as well. Former Trump campaign manager and current CNN contributor Corey Lewandowski is involved in “preparing Donald Trump for the debates,” according to the conservative site Heat Street. While he was in charge of Trump’s campaign, Lewandowski had hostile interactions with the press corps covering Trump. He was caught on video grabbing Michelle Fields, then a reporter for Breitbart News. Florida prosecutors said they believed there was probable cause to arrest Lewandowski, but decided against prosecuting him. Lewandowski continues to receive what are described as “severance” payments from the Trump campaign while commenting on the election in a paid position for CNN. On air he has been a reliable Trump defender, promoting the racist birther conspiracy theory, smearing journalists who report on the nominee, and lying about Trump’s history of using undocumented workers. Stephen Bannon is the chairman of Breitbart News but is currently on leave to serve as the chief executive of the Trump campaign. The Washington Post reported that he is part of the unofficial Trump debate team that met with the candidate at the Trump National Golf Club in Bedminster, NJ, in August. After news surfaced that Trump’s then-campaign manager had allegedly manhandled Michelle Fields, who was working at the time as a Breitbart reporter, Bannon sided with the campaign over his employee, leading to the defection of several staffers. Several former Bannon employees have spoken out about his hiring by the campaign. 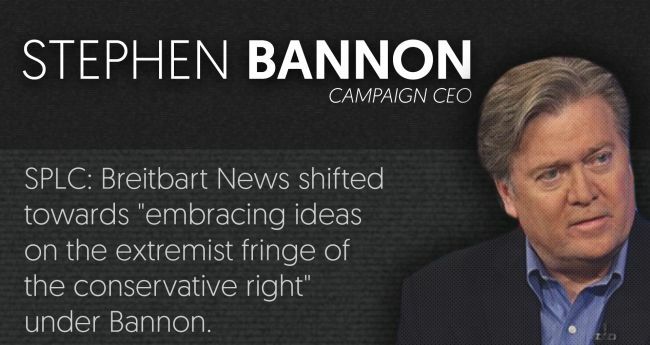 Former Breitbart editor-at-large Ben Shapiro called Bannon a “legitimately sinister figure” who has led Breitbart News to embrace the “white supremacist alt-right.” Former Breitbart News spokesperson Kurt Bardella told Media Matters that Bannon is a “pathological liar” whose hiring signals a “dangerous" shift by the campaign. Former New York City Mayor Rudy Giuliani has served as a campaign surrogate for the Trump campaign and was identified as a “longtime friend” of the candidate who is involved in debate preparations. Giuliani has a long history of making anti-Muslim statements. He argued in favor of Sen. Ted Cruz’s (R-TX) comment that one way to fight terrorism is to “patrol and secure Muslim neighborhoods,” said sexual assault in Germany proved that “these [Syrian] refugees are inherently a problem,” and praised Rep. Peter King (R-NY) for holding anti-Muslim hearings in Congress. Radio host Laura Ingraham has been a staunch supporter of Trump’s candidacy and has praised his anti-immigrant rhetoric. Ingraham spoke at the Republican National Convention and urged Trump’s former rivals to “honor your pledge” and “support Donald Trump now.” She has been described as one of Trump’s “informal band of counselors” who are helping him to “test out zingers” ahead of the debate. New Jersey Gov. Chris Christie endorsed Trump after he dropped out of the campaign and has served as a leading surrogate for the candidate. He is the head of Trump’s transition team and is reportedly helping with debate preparations. Another mark against Christie has been the Bridgegate scandal, in which his subordinates conspired to block traffic on the George Washington Bridge as payback for political slights against the governor. Conservative activist David Bossie has taken a leave of absence from his job as president of the advocacy group Citizens United to be Trump’s deputy campaign manager. He is reportedly part of the debate preparation team. In 1992, then-President George H.W. Bush condemned Bossie and Citizens United for using what he called “filthy campaign tactics” against the Clintons during the 1992 presidential campaign. Following President Clinton’s election, Bossie used his role as Citizens United’s political director to operate “an information factory” that produced “a steady stream of tips, tidbits, documents, factoids, suspicions, and story ideas for the nation's press and for Republicans on Capitol Hill,” according to Columbia Journalism Review. 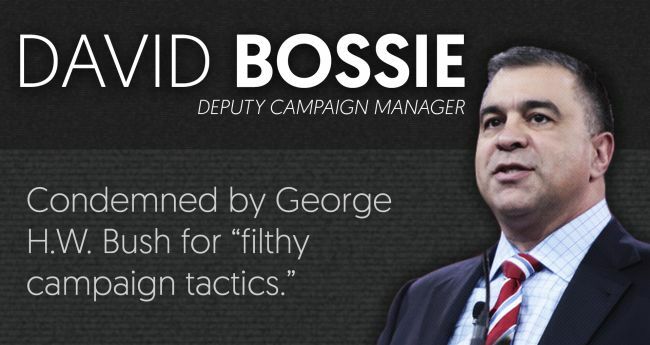 Bossie resigned from his position as an investigator for the House Government and Reform Committee after it was revealed that he played a role in releasing selectively edited transcripts in order to smear Hillary Clinton. Bossie has been president of Citizens United since 2000. The group’s film Hillary: The Movie prompted the Supreme Court case Citizens United v. FEC, which resulted in the 5-4 decision that has led to nearly unlimited campaign spending in elections. Citizens United has pushed for the release of Hillary Clinton’s communications from the State Department when she was secretary of state, and the organization is a party in several lawsuits demanding Clinton-related materials from the agency. In the course of making those requests, Citizens United has often insinuated -- without evidence -- that wrongdoing took place. Republican dirty trickster Roger Stone is a longtime Trump ally. Stone worked on Trump’s campaign until August of 2015, continues to serve as a prominent advocate for Trump’s candidacy, and regularly speaks with Trump. Stone advised Trump on debate negotiations and helped Trump with debate prep during the primaries. While advocating for Trump, Stone has peddled several outlandish conspiracy theories. He accused the Clintons of murdering several more people, argued that the 2016 election will be “rigged” via the manipulation of voting machines, and alleged that a top Clinton campaign aide was connected to the 9/11 terrorist attacks. Stone also attacked the family of Capt. Humayun Khan, who was killed in Iraq in 2004. Kellyanne Conway served as a senior adviser and pollster for the Trump campaign, and she is currently serving as the campaign manager. Conway has been part of the core team preparing Trump for the debate. 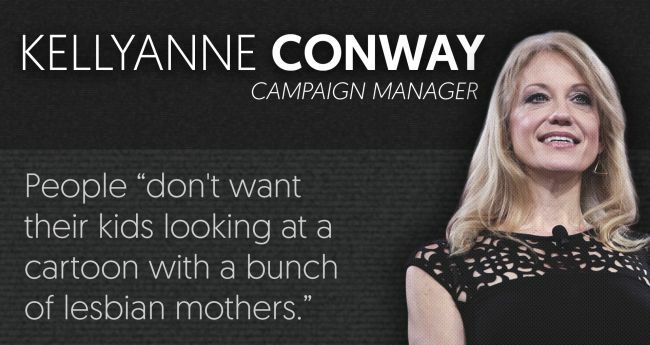 Conway has long been involved in conservative politics, mostly as a pollster working with conservative groups including the NRA and Family Research Council and Republican candidates including Newt Gingrich and Michele Bachmann. Retired Army Lt. Gen. Michael Flynn, former head of the Defense Intelligence Agency, is a Trump adviser and campaign surrogate. Flynn is part of the national security team preparing Trump for the debate.